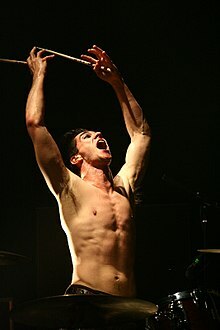 Brian Viglione (born 16 May 1979 in Greenville, New Hampshire) is the drummer for The Dresden Dolls and New York City's swing-punk orchestra, The World/Inferno Friendship Society. It has become this really beautiful network of people, both professional and amateur, that just come together to have a good time depending on what city we're in. For us the Dresden Dolls were porcelain dolls that were made in that city at the time, that is what they were to us, and also a reference in Slaughterhouse 5 by Kurt Vonnegut, and in a song by The Fall. That is the spirit of the music: to not leave anyone out, to be inclusive. Music is one of those things that brings great joy to people, singing is a sort of unifier of people, no matter what political place or original place you come from. We are a lot more alike than we are different and it's important to remember that. The spirit of punk-cabaret is that you fell that you can truly be all of who you are. Interviewer: Have you ever attended a mime school? Brian: Nop. Never. I used to watch a lot of cartoons and the Muppets Show and that's why I make the funny faces. So it was all cartoon and Jim Henson. This page was last edited on 21 February 2016, at 13:37.